Circa 1500 Hungarian saber - this was essentially the prototype of all of the magnificent eastern and central European sabers that prospered in the 18th and 19th centuries. Situated at the crossroads of Europe and Asia, Hungary was often warring with both, as well as being alternately allied and/or at war with Byzantium. This abundance of cultural exposure was echoed in Hungarian weapons. This solidly constructed saber is capable of powerful blows from horseback or foot. 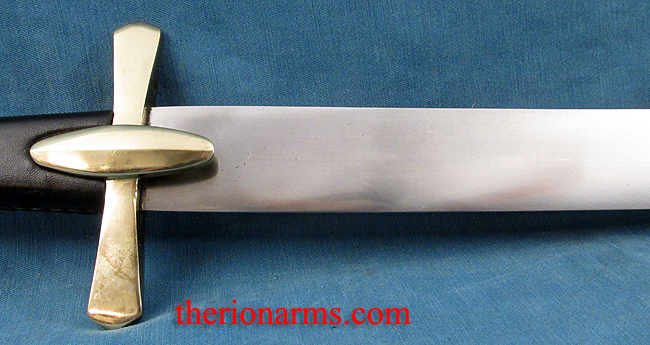 This reproduction features a tempered 1095 high carbon steel blade, brass guard and pommel, wood grip covered in leather, and a wood core leather covered scabbard with matching fittings.